The weather is improving, the days are getting longer and more and more people are getting outside - including me. Just this past weekend, I took my mountain bike to Sumas Mountain to take in the beautiful trails — and with the lower parking full, there were many other like minded people there doing the same. I slowly made my way up to Knob Gobbler via the utility road, and proceeded my way down to catch up with Squid Line, quickly descending on one of my favourite trails. As I got near Access 19, I noticed a couple standing there taking in the beauty but as I passed, I noticed that one of them was favouring their right arm so, I stopped to ask if everyone was okay. As it turned out, they were both lost, trying to find their way to Chadsey Lake - traveling south along Access 19. If you aren’t familiar with this part of the trail, this was indeed the wrong direction and nowhere near where they were trying to go. They weren’t 100% sure but, they both felt like they weren’t going in the right direction. What was worse, they were aimlessly wondering, looking for anything that would tell them where they were so they could get their bearings. To compound the situation, one of them had what looked to be a sprain. Whenever I am out in the back country, I am prepared and being on a mountain that’s just outside of Abbotsford’s urban hustle and bustle —it’s no different. It’s a large mountain and anyone (and I do mean anyone) can easily find themselves lost, hurt or, not where they want to be — like my two hikers. Even while mountain biking, I do carry the essentials including a map and a phone App called Trail Forks. Trailforks is a great, free App that can be downloaded into your smart-phone for on/off line viewing. So, if you find yourself without cell service and a clue of where you are, rest easy. 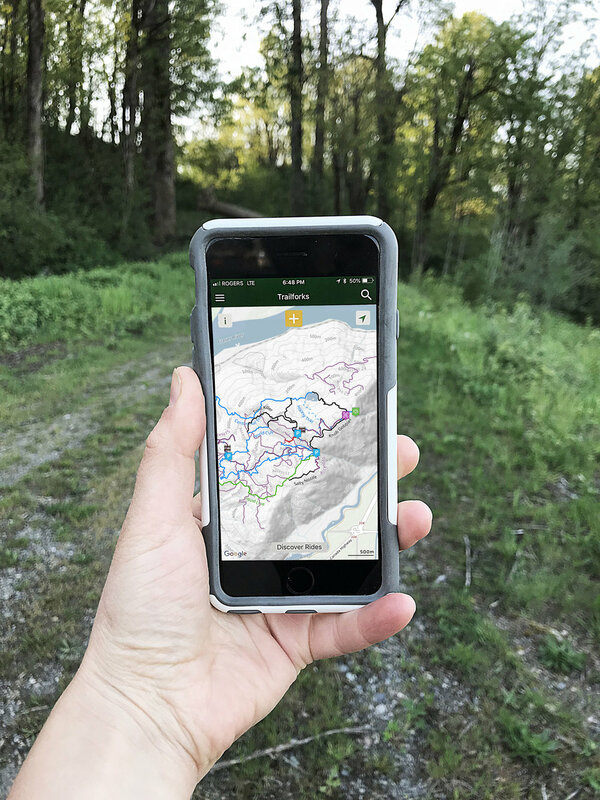 Just launch the app and voila — a layout of the terrain and the trail network. Before going out though, you must download the area in which you plan on visiting incase you are without proper cell reception. What’s even cooler is that the data is all user-generated meaning that the trails are updated constantly with reports of their condition, difficulty and photos so that you can familiarize yourself before venturing off on said trail. Moreover, the app also tells you your “Emergency Information” which does a pretty good job at using your phone’s GPS chip to pinpoint some lat/long coordinates. Mind you, it’s extremely rudimentary. The App is mostly used by the biking community which outline where the trails are within any given area so, keep this in mind that you will most likely be sharing the trails with other users — be courteous and aware. Where this App would have helped my hikers is that it would have shown them where they were within the trail network – letting them know much earlier that they were heading in the wrong direction. Furthermore, if their injury was worse, the App would have been able to show where the utility road was with respect to their location — making an emergency response much more efficient. No way am I advocating cruising the trails with nothing more than your smart-phone but what I am saying is that the Trailforks App is a great supplement to an already useful device. We always suggest familiarizing yourself with the area in which you are hiking, carry the appropriate gear and plan not for what you expect to happen, but what you don’t expect to happen. So, head on down to the App store and check it out – play with it, get familiar with it and have fun with it — it’s a great App.